Thanks to Dr. Dhiraj B. Nikumbh, ACPM Medical College, Dhule (India) for contributing this case and Dr. Belinda Lategan, St. Boniface Hospital, Winnipeg, Manitoba (Canada) for editing the discussion and to Dr. Emily S. Reisenbichler, Yale School of Medicine, Connecticut (USA) for her review. 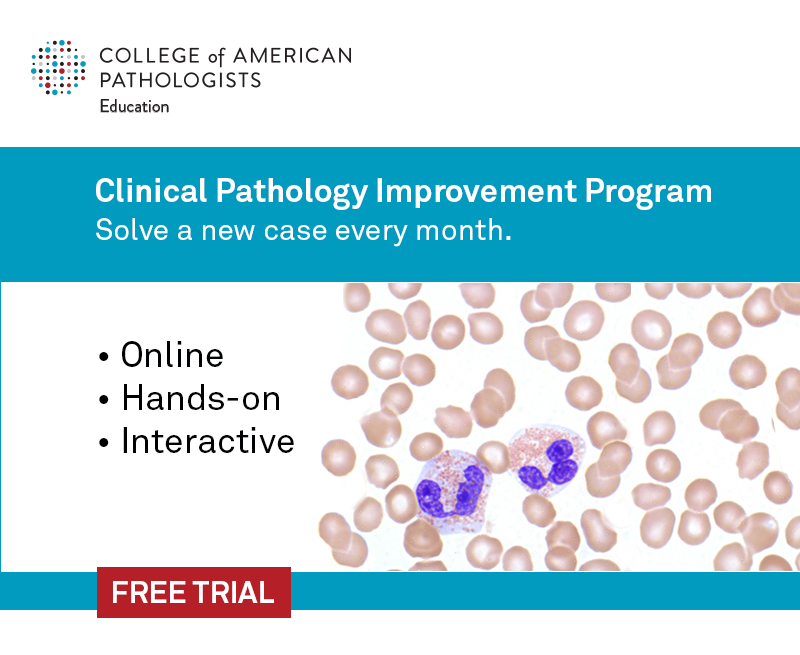 To contribute a Case of the Week, first make sure that we are currently accepting cases, then follow the guidelines on our main Case of the Week page. (1) Dr. Pernick has written a new paper, How Cancer Arises Based on Complexity Theory, that he has been working on for many years. See http://www.natpernick.com/HowCancerArises.pdf. We believe it is important to have an adequate number of high quality images on our server, because images on other servers often disappear. If you own images of these entities, please email them as attachments to Dr. Nat Pernick at NatPernick@gmail.com, and indicate how you want your name to be displayed, as we acknowledge you as contributor. 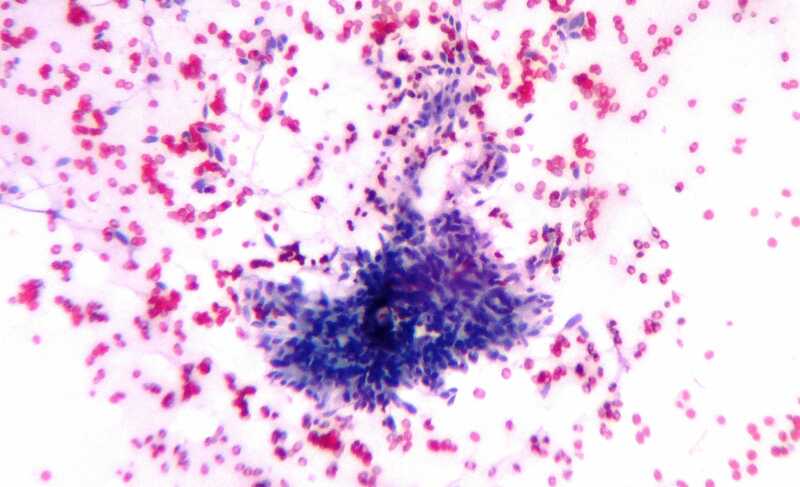 (3) Have you thought about being an Author at PathologyOutlines.com? We are looking for great writers to help update our free online textbook. By becoming an author you gain international exposure and have publications you can add to your CV. Starting in 2018, for recent authors who have written 3+ topics, we will increase our honorarium to $50/topic, invite you to our Author breakfast at USCAP and give you an Author pin and PathOut ball cap. Please review our Author information page at http://www.pathologyoutlines.com/authorinformation.html, and email your CV to erinthomas3161@gmail.com with your areas of expertise / interest. 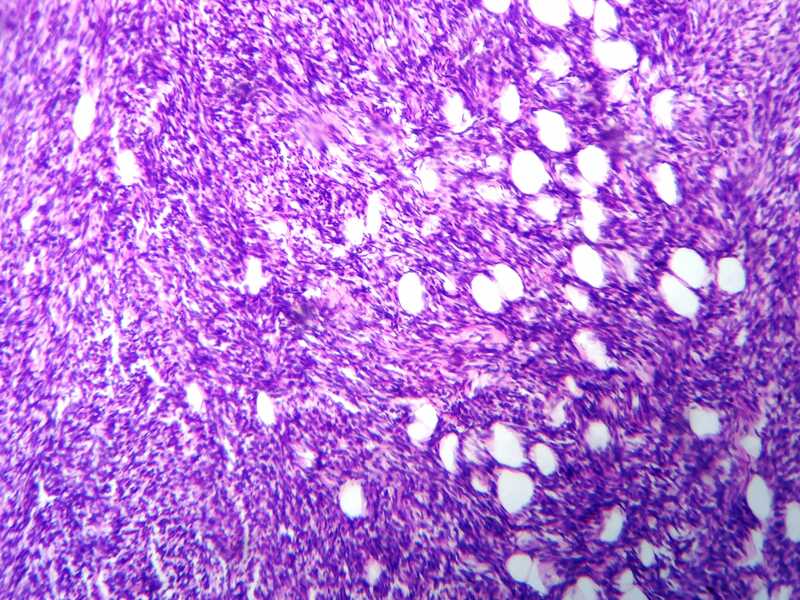 A 64 year old woman presented with a huge left breast mass, present for 6 months. 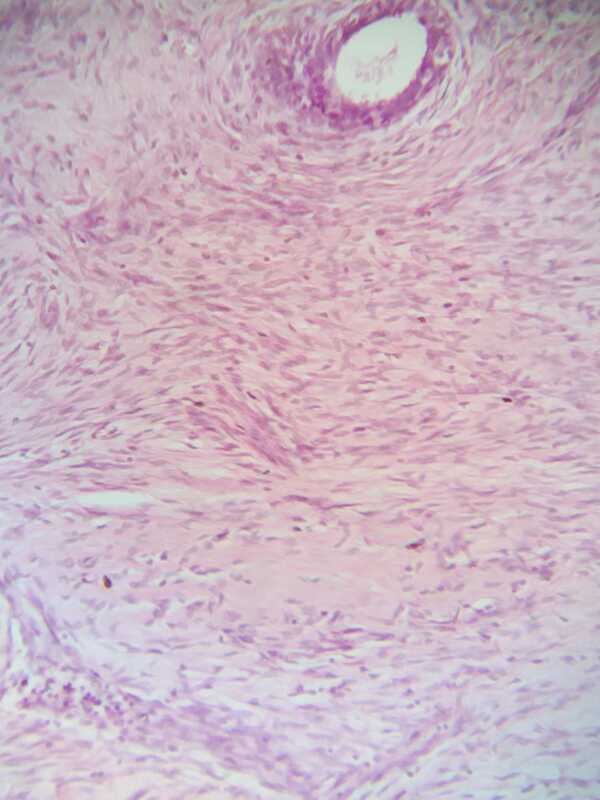 Examination revealed an irregular nodular lump measuring 25 X 24 X 20 cm with overlying stretched skin. 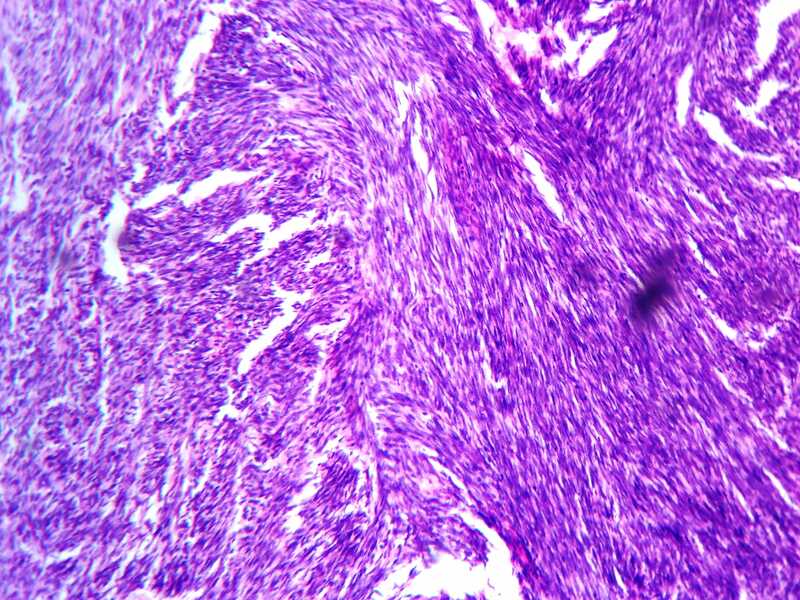 It was clinically diagnosed as carcinoma of the left breast and FNAC was performed, followed by excision. 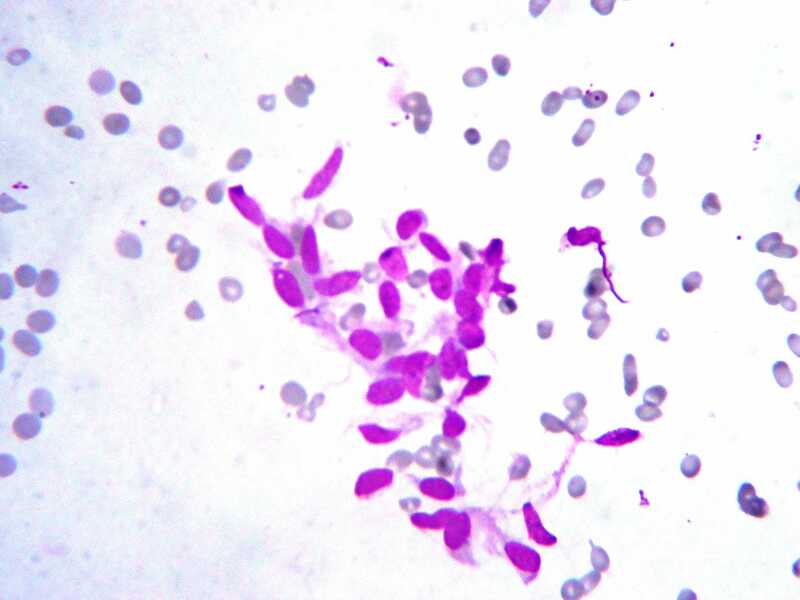 Cellular aspirates of mildly to moderately atypical spindle cells with scant cytoplasm and prominent nucleoli arranged in sheets, clusters and as single cells. Phyllodes tumors are part of a spectrum of biphasic neoplasms of the breast. 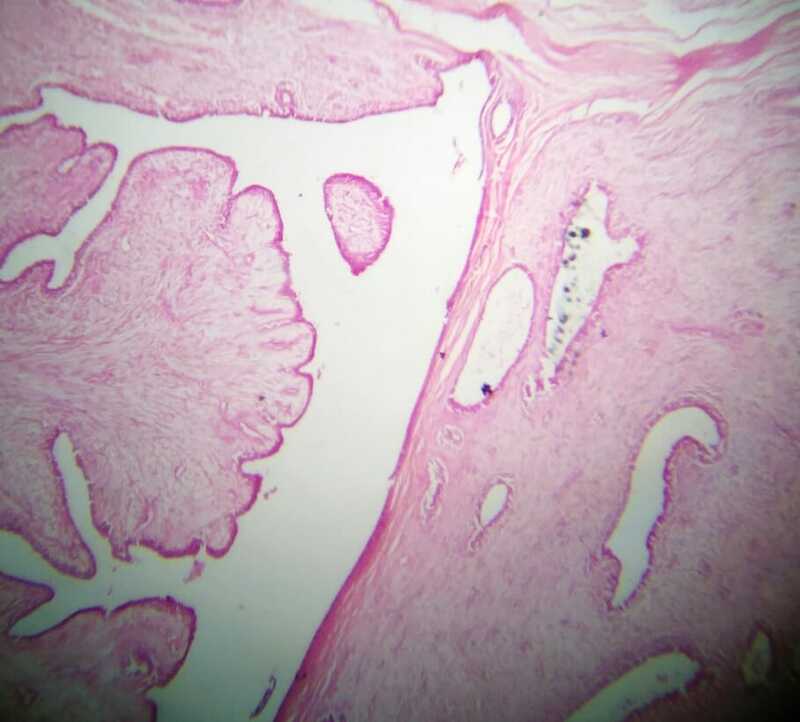 In phyllodes tumors, the stromal component is predominant, often with an exaggerated intracanalicular growth pattern resulting in leaf-like structures protruding into cystically dilated spaces. 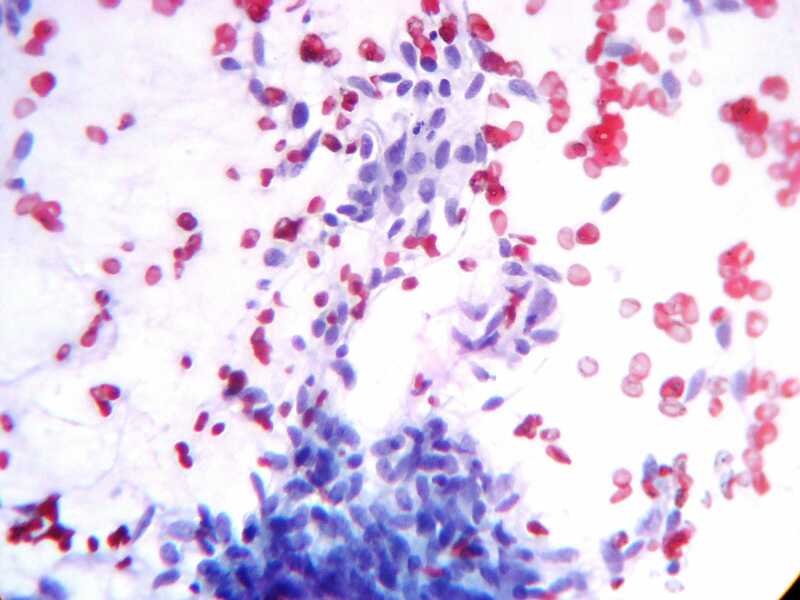 The stroma in phyllodes tumors demonstrates a range of cellularity, cytologic atypia, mitotic activity (expressed per 10 HPF; 40x), heterologous elements, stromal overgrowth (lack of epithelial elements in at least 1 low power field [4x]) and potentially infiltrative margins. These somewhat ill defined and subjective stromal characteristics are the basis for grading phyllodes tumors as benign, borderline or malignant to predict behavior (recurrence and metastatic risk) and guide management (Lakhani: WHO Classification of Tumours of the Breast, 2012, Histopathology 2016;68:5). 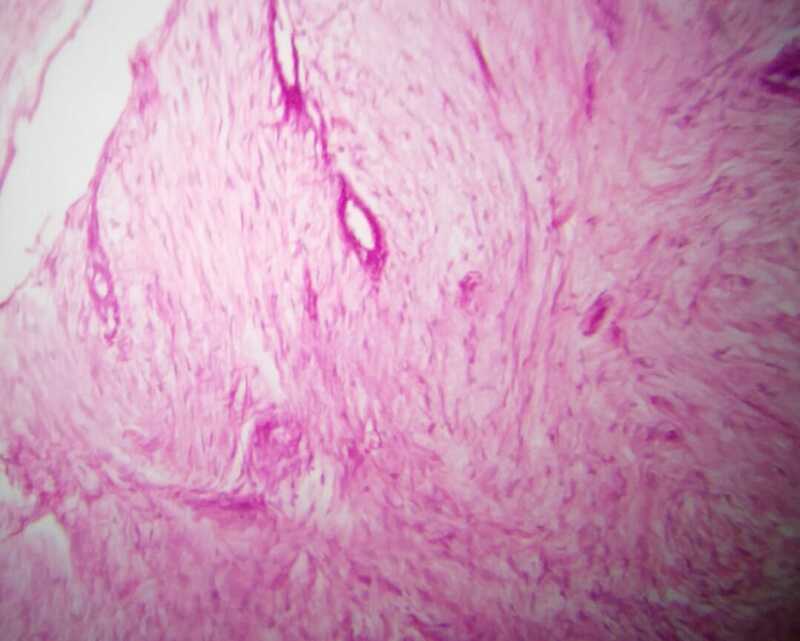 At the benign end of the spectrum of fibroepithelial lesions there is overlap between phyllodes tumors and cellular fibroadenomas. 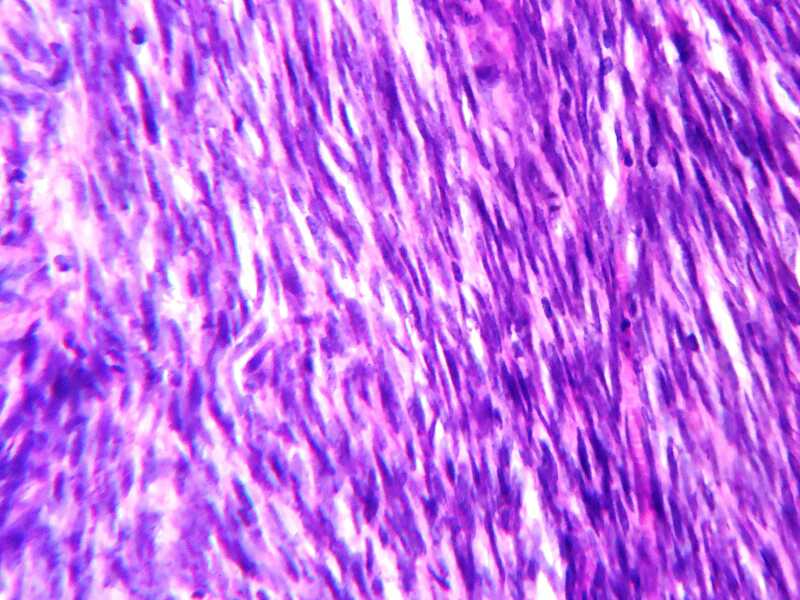 Malignant phyllodes tumors may demonstrate features in common with spindle cell metaplastic carcinoma, primary sarcoma and other predominantly spindled lesions of the breast. Borderline phyllodes tumors are intermediate between benign and malignant phyllodes tumors (Semin Diagn Pathol 2017;34:438). These lesions cannot be reliably distinguished on imaging features alone. The overlapping histologic features are especially problematic in the setting of limited sampling (e.g. 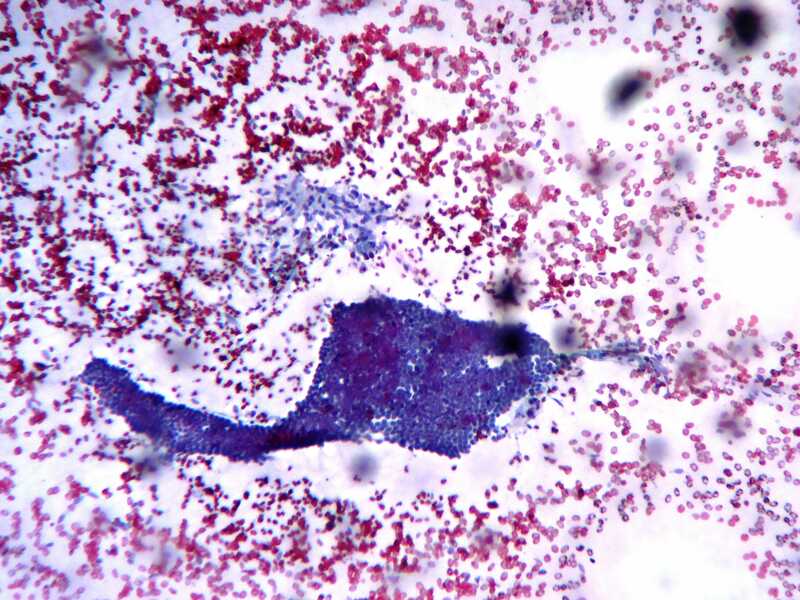 fine needle aspiration cytology (FNA) and core needle biopsy specimens) and may pose difficulty in inadequately sampled excisional specimens (Int J Surg Pathol 2014;22:695, Acta Cytol 2017;61:418, J Cytol 2010;27:59). Morphologic heterogeneity is inherent in these lesions and even malignant or borderline phyllodes tumors may focally include areas of unequivocally benign fibroadenomatous architecture, as illustrated in our case (Semin Diagn Pathol 2017;34:438).Thorough sampling of at least 1 tissue block per centimeter is the minimum recommended and more extensive sampling may be required to identify residual epithelial elements in very stromal predominant lesions. 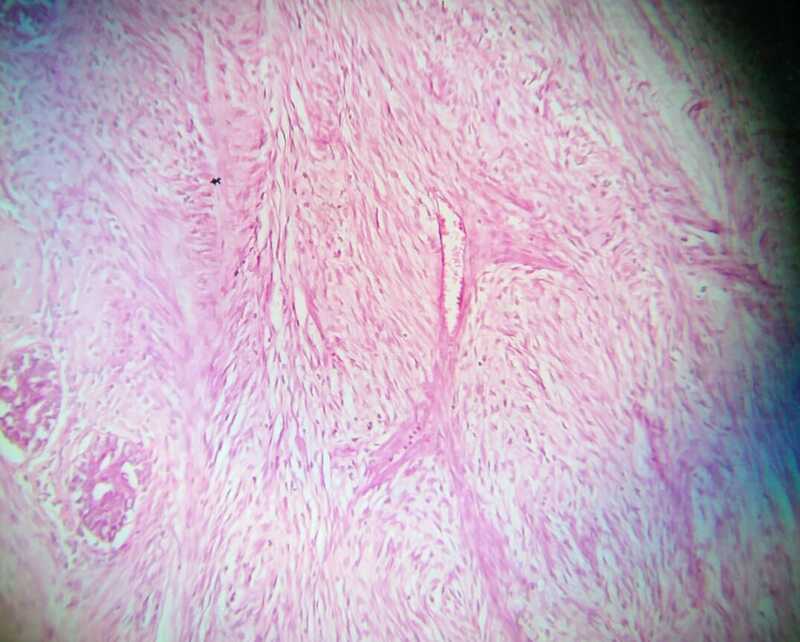 Ancillary studies, including immunohistochemistry, are of limited use in isolation and must be interpreted cautiously, taking into account the overall architecture of the lesion on excision. Focal stromal expression of keratins in particular must be interpreted with caution as this has been described in phyllodes tumors. 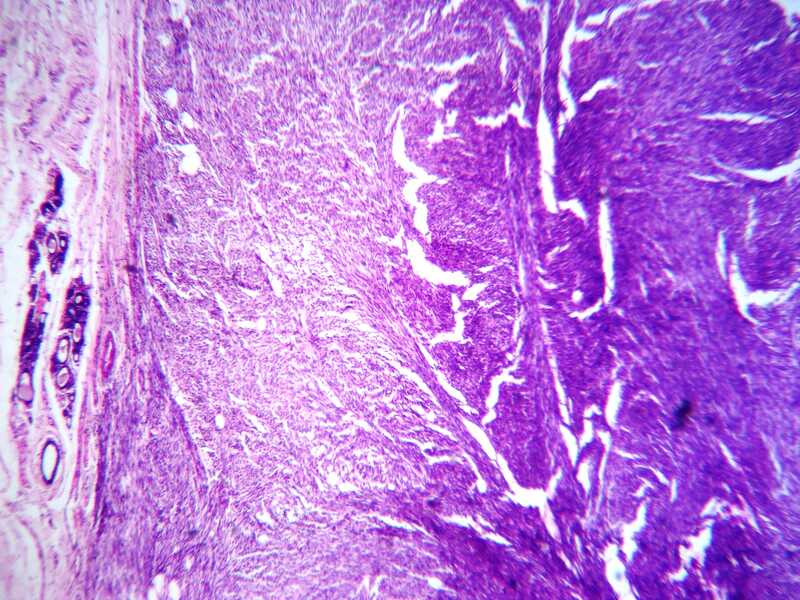 Genome sequencing studies have demonstrated recurrent somatic mutations of MED12 (mediator complex subunit 12, also frequently seen in uterine leiomyomas) in fibroadenomas (59 - 67%) and phyllodes tumors (45 - 67%). 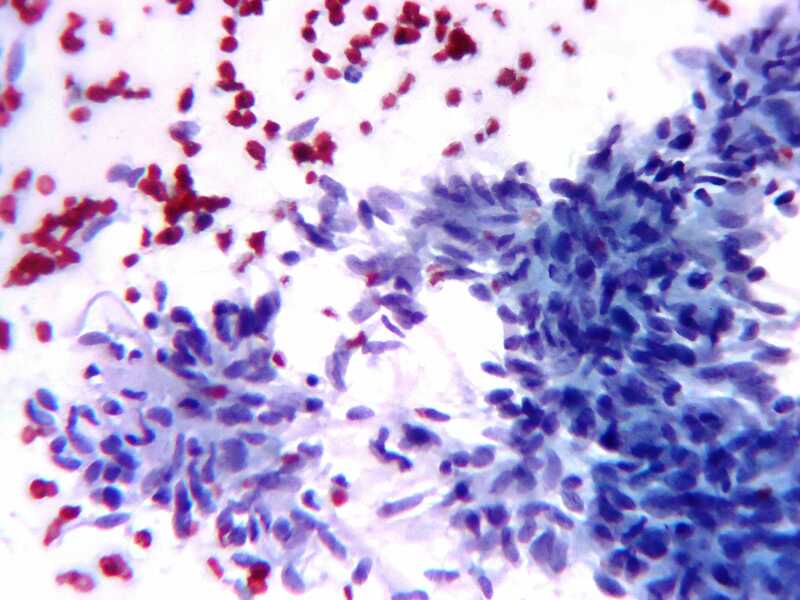 This may suggest both entities share a genetic etiology with MDM2 mutation as an early event in their pathogenesis (Arch Pathol Lab Med 2016;140:665). 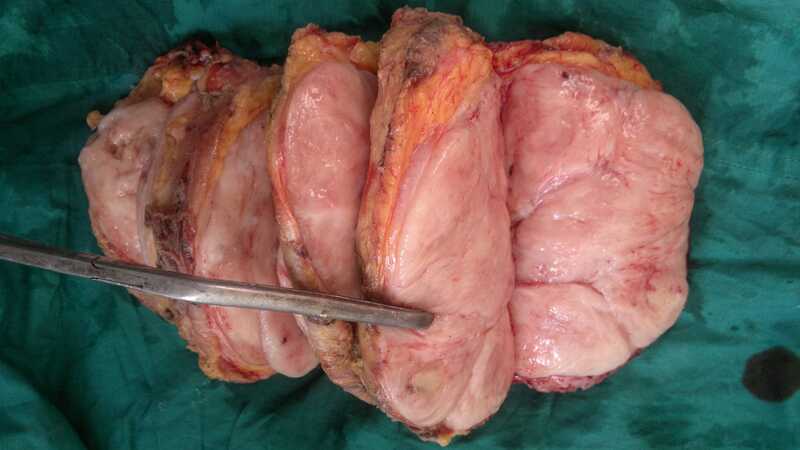 Phyllodes tumors are managed surgically and only rarely recur following complete excision. 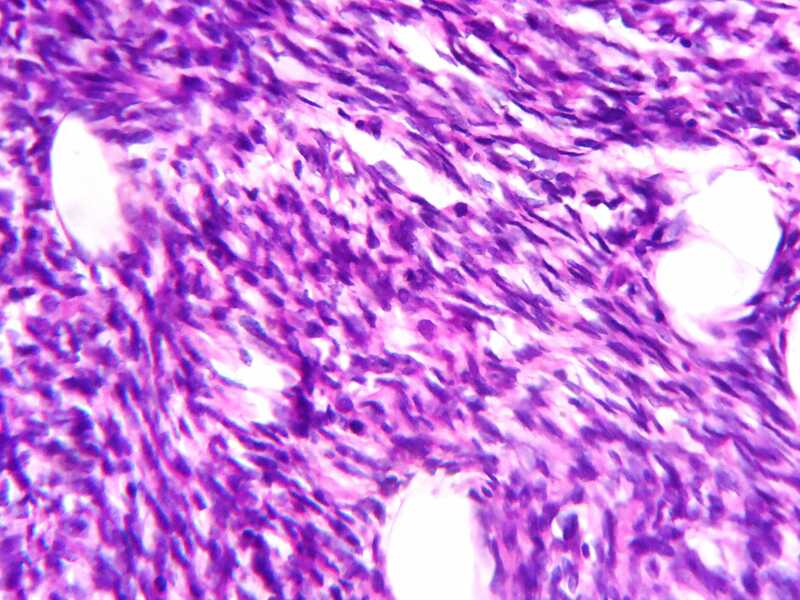 The most important predictors of recurrence free survival are stromal atypia, stromal overgrowth and surgical margin status (J Clin Pathol 2012;65:69). Whille some studies have stipulated a 1 cm rim of normal tissue as the optimal margin, others have not demonstrated similar findings (Mod Pathol 2016;29:259, Ann Surg Oncol 2016;23:1543).